The waterfall is not so strange to us, however the great waterfall around the world is less to visit by us, meanwhile Huangguoshu Waterfall in China is one of the famous waterfall as natural wonder. If you no chance to travel it, you may read my post and know Huangguoshu waterfall well.Click Here For More. Huangguoshu Waterfall is famous from Xu Xiake, a traveler in Ming Dynasty. Click Here For More. It has become a famous scenic spot through the travels and dissemination of celebrities in past dynasties. Huangguoshu Waterfall, formerly known as Baishui River Waterfall, is named for its widespread distribution of “Ficus lacorBuch.-Ham”. 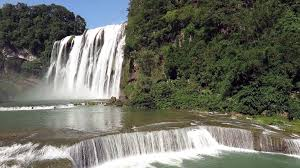 It is located in Zhenning Buyi and Miao Autonomous County, Anshun City, Guizhou Province, China, it belongs to the Baishui Reach of the lower reaches of the Kebu River, a tributary of the Dabang River, a branch of the Nanpan River, the main stream of the Xijiang River. It is the largest first-class waterfall in the Huangguoshu Waterfall Group and one of the world famous waterfalls. It is famous for its vast water potential. The height of the waterfall is 77.8 meters, of which the main waterfall is 67 meters high; the width of the waterfall is 101 meters, of which the width of the main waterfall top is 83.3 meters. Huangguoshu Waterfall is a typical erosion-fracturing waterfall in Karst landform.